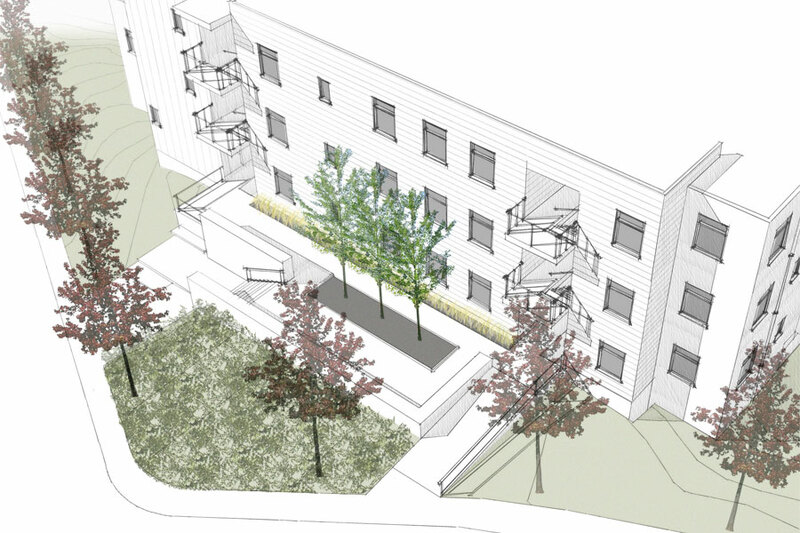 This mixed-use, multi-family housing development takes advantage of a constrained, atypical site to accommodate 15 two-bedroom units on three floors over a basement level of structured parking and one commercial retail space. 20% of the apartment units meet affordable housing standards and all ground level units are ADA accessible. The 0.40 acre site is located in historic Belmont, a residential neighborhood with a diverse mix of housing types at the edge of the Charlottesville city limits as the Route 20 corridor transitions from a slow, two-lane city street to a 4 lane divided road that connects to interstate traffic on Route 64. The massing and scale of the project balance this dramatic shift in context and scale. The project qualified for a Special Use Permit to increase the density allowed and underwent Entrance Corridor Design Review by the planning commission. Using conventional residential materials such a clapboard siding and stucco which reference those of the surrounding context and manipulating how window openings are arranged and grouped together, the project’s exterior envelop simultaneously blends with the more modestly scaled homes as well as responding to the larger scale of the vehicular corridor and the vast mountain views.